October 24, 2017 - Like us now! SSDs are much faster than HDDs and they literally make the everyday performance of your PC faster. 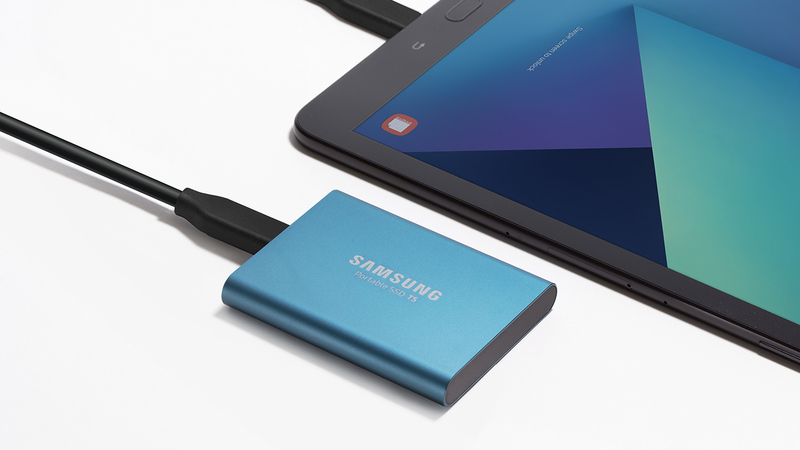 There is no doubt that Samsung makes one of the best SSDs and the Samsung portable SSDs are at their lowest price now. 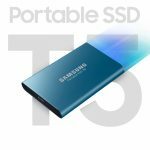 We are talking about the Samsung T5 500 GB SSD which is now available to purchase for just $180. 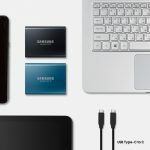 The SSD’s original price is $200 but it never seems to drop ever. The last lowest price we saw was $190. 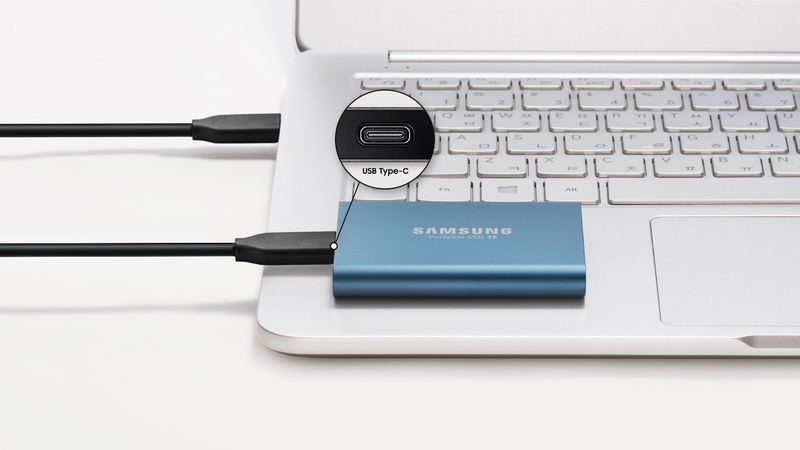 The Samsung T5 SSD comes with USB Type-C input and a USB C to C and USB C to A cables as well. 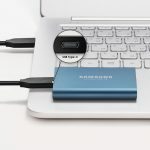 You can connect the hard drive to any PC or even any smartphone with USB type C port or with USB A cable using a USB OTG adapter. 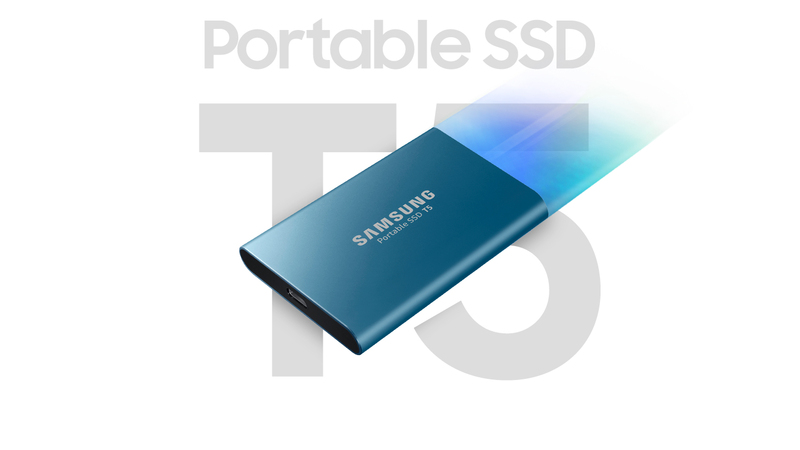 Samsung claims that the T5 is shock resistant and supports a maximum transfer speed of 540MB/s. It was launched in August and received excellent reviews from all the big review sites. 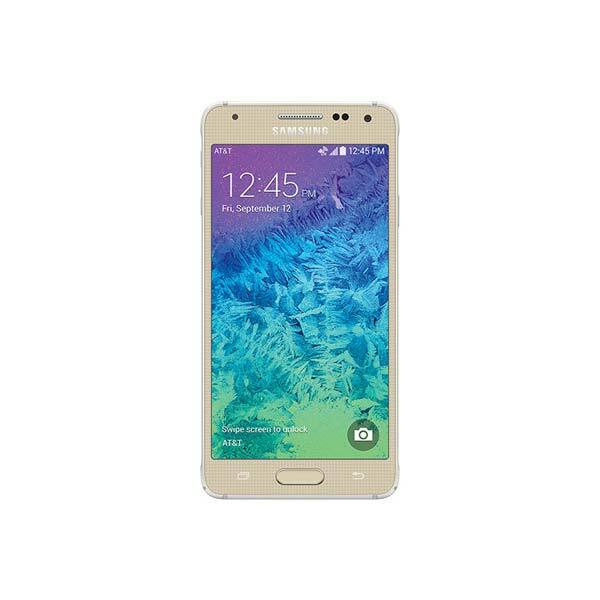 The size is very compact and it easily fits in the palm of your hand. Moreover, it comes in a beautiful, blue and black colors. 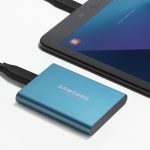 It also comes in 1 TB and 2 TB versions and you’ll have to pay a lot more to get them. 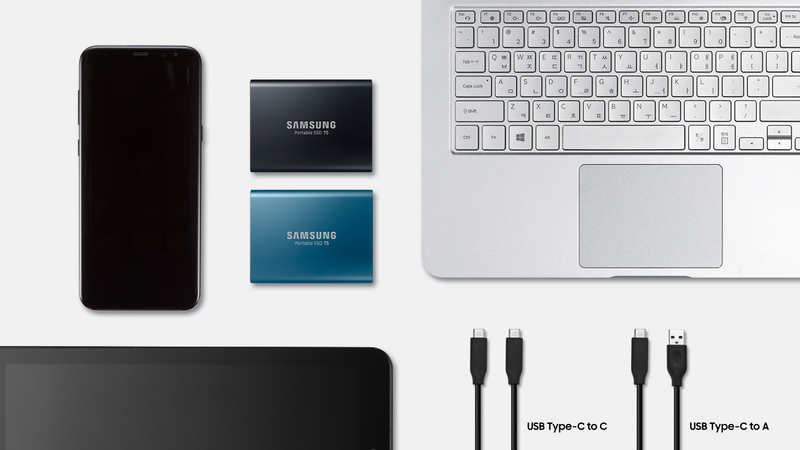 The T5 also comes with an app for your phone which lets you manage your solid state drive from your phone. It is to keep in mind that this SSD is not available in Pakistan yet. 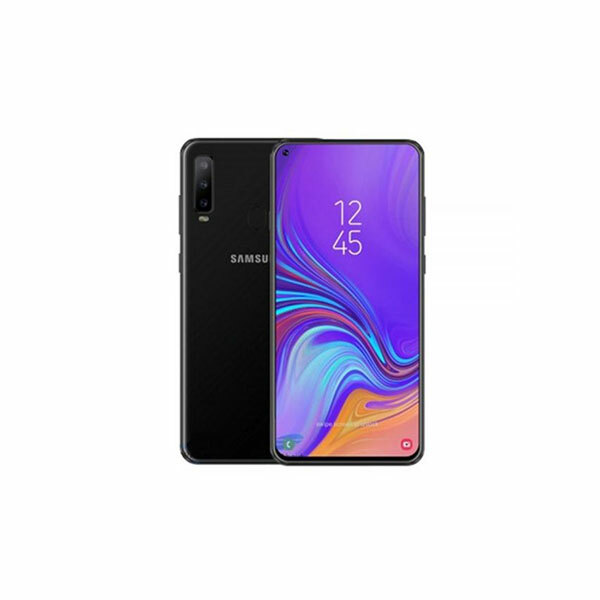 But as the price is dropped internationally, we can expect that the overall prices of SSDs will drop in Pakistan as well. Comes in Blue and Deep Black color. 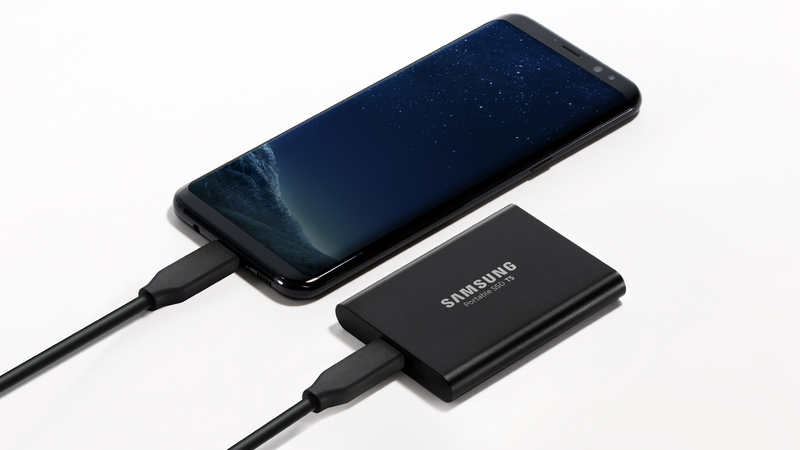 Includes 2 cables, a USB Type C to C and a USB Type C to A. 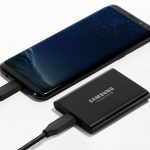 Can be connected with any smartphone. 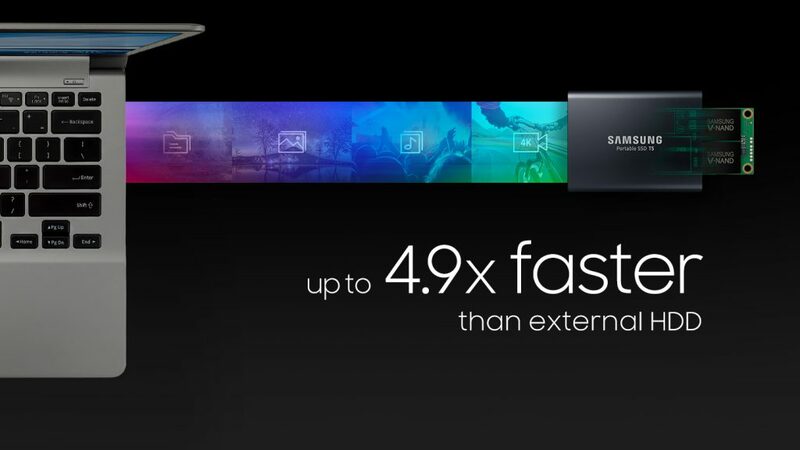 4.9x faster than external hard drives.